Community decisions should be led by community members. The Confederated Tribes of Siletz Indians (CTSI) wants their growth over the next ten years, their community spaces, their programs and services, to reflect the hopes and dreams of all their tribal members. Every decade since federal recognition was restored in 1977, the Confederated Tribes of Siletz Indians has created a comprehensive plan. This document guides Siletz tribal government and leadership through decisions they will make over the next ten years. For example, the first 10-year plan led to education programs and services, administrative offices and a community center. The second resulted in a new clinic. The comprehensive plan is a visionary document, and CTSI always invites tribal members to participate in creating it. However, they’ve had trouble engaging more than a few folks – the “usual suspects” – each time. After community visits to Siletz and conversations with CTSI leaders, Northwest Area Foundation and Northwest Health Foundation agreed to hire a consultant to help CTSI figure out how to engage all their tribal members in creating their next comprehensive plan – 100% of tribal members. CTSI is working with Indigenous-owned consulting firm Shoreline Consulting. Shoreline Consulting and CTSI staff have recruited several tribal members to join a Community Visioning Team, with an emphasis on members who will be most affected by the comprehensive plan (e.g. youth, mothers with children in the preschool program, members using addiction services, etc.). Shoreline knew they had to build trust and show up where people already were, so they attended Youth Council meetings, a potato bake, Restoration and other community events to meet and talk to tribal members. Now, the Community Visioning Team will help make an engagement plan. Some of the questions they’ll try to answer: How can we engage the 75-80% of tribal members who live outside Lincoln County? How can we engage the people who are least likely to participate? How can we foster energy and enthusiasm so tribal members are excited to not just inform the 10-year plan, but also become involved in future tribal affairs and endeavors? How can we ensure this plan is a living document? According to consultant Shadiin Garcia, this process and document have the potential to be healing and transformative. CTSI’s comprehensive planning celebrates tribal sovereignty. It also empowers the Siletz community to thrive on their own terms and improves well-being for future generations. Northwest Health Foundation is honored to play a small part in supporting this work. Visit ctsi.nsn.us to learn more about the Confederated Tribes of Siletz Indians. Economic opportunity and stability are key to good health. When families can afford quality housing, food, healthcare, childcare and other necessities, individuals and communities do better. In 2012, our communities weren’t doing well. Families struggled to make ends meet, and nearly one out of 10 Oregonians was unemployed. Due to the Great Recession, many of these folks were unemployed long term, leading to depression and other mental health issues. At the peak of unemployment in the United States and our region, researchers at the mid-Willamette Valley Worksource Center (then called Job Growers, now the Willamette Workforce Partnership) discovered that programs in Britain and Australia were successfully using cognitive-behavioral therapy to improve the mental health of the long-term unemployed and, thus, help them find jobs. Inspired by reading about these programs, Willamette Workforce Partnership created a series of workshops based on cognitive behavioral principles. Kaiser Permanente Community Fund funded a small pilot. Results were positive, and the federal Department of Labor then funded a state-wide five-year project. To date, more than 1,200 unemployed people have gone through the workshop series in WorkSource Centers around the state. The workshop runs for four weeks, with three two-hour session per week. Topics covered include: how thoughts and feelings affect behavior, risky thinking and how to counter it, increasing emotional awareness, managing negative emotions, building self-esteem, goal setting and maintaining momentum during a job search. Willamette Workforce Partnership plans next to pilot test the workshop series with groups that historically face more barriers to employment. That includes job seekers with various disabilities, young adults with Autism, social service recipients, workers’ compensation participants, and folks being released from incarceration. Beginning this September, Public Policy Associates will formally evaluate the five-year project. Preliminary results will be available in December. In 2017 and 2018, Northwest Health Foundation convened the Disability Justice Leaders Collaborative – a group of fourteen disabled people of color interested in deepening their understanding of disability justice and discussing visions and strategies for ensuring the needs of people with disabilities are centered in decision-making. Myrlaviani is one of the leaders participating in the Collaborative. What is your vision for the future of our region? I envision Disabled People of Color winning political positions, influencing decisions, and deepening our overall capacity as a community. What is most exciting to you about Disability Justice? Disability Justice demands, by way of compassion and caring communities, systems change, institutional reform, and a new notion of private and public market performance defined, owned, operated, and valued by community members most impacted. Disability Justice is all about creativity and innovation. It’s invigorating and demanding. It means you have to show up and demonstrate radical self-love and compassion, which are founded on standards of quality caring and intimate connection. We account for the complex strata of universal access, intersectionality of race, disability, gender, and religion with the never-ending and always-loved question of “What am I missing here, right now? Do we have what we need?” We are the road builders and bridge architects we need. I feel we are ready for Us. What do you hope to get out of being a part of the Disability Justice Leaders Collaborative? My goals include organizing a group of leaders holding conversations within and across urban-rural communities to discover and cultivate participants committed to policy and program change and implementation. Addressing current power dynamics will enhance collaboration across systems by way of generating ideas and building alternative solutions. Our community has the solutions and, through strategic partnerships, we can help lead and build the results we need. What leadership roles do you hope to take on in the future? I am committed to becoming a better transformational leader: identifying, cultivating, and promoting leadership and leadership development in Disability communities. I am keen on improving the employment rates of individuals with disabilities and recognize this will require not only policy change but also changes in awareness and attitudes on the part of families, businesses, and civic leaders. What communities do you consider yourself a part of? Disability foremost, and all else follows. I come from a multicultural background. I grew up dancing flamenco, listening to Tejano music, being friends with Latins from Central America to South America to Spain, marching with Chicano Agricultural Workers (Cesar Chavez), listening to my Mother’s stories of her ancestors and, on my Father’s side, learning about poverty and oppression, or how the Mexican-American wars impacted the trajectory of his family’s development. The cultural extremes from both families provided a rich and textured playground of possibilities from which my curiosity and drive still develop. What leadership roles have you played? I have participated in local advisory boards or commissions, as well as community engagement work across Disability lines, especially with “People of Color.” I also started a community restorative listening circle. I have been particularly enthusiastic in volunteering for positions that work towards criminal justice reform, racial justice, and disability justice, across government and community-based organizations. What is your favorite book, movie or song, and why? The book I’m enjoying the most right now compels me to wonder and enjoy breathing, reading, imagining impossibilities and living, again. It is Dirty River: A Queer Femme of Color Dreaming Her Way Home by Leah Lakshmi Piepzna-Samarasinha. Artists lead the way for social change and Leah Lakshmi Piepzna-Samarasinha is wonderfully and refreshingly uncompromising. Is there anything else you want people to know? When you love something or someone, including yourself, you make a stand, define your standards, live with integrity and a willingness to self-assess. With that in mind, I’m curious about what is important to my fellow Disabled community members. I want to know what satisfies and, equally, what leaves them with discontent within our current system. Further, what improvements are they willing to invest their talents, energy, and time in to create and operate? If you are interested in developing dialogue around these and other questions, please contact me through NWHF. In 2017 and 2018, Northwest Health Foundation convened the Disability Justice Leaders Collaborative – a group of fourteen disabled people of color interested in deepening their understanding of disability justice and discussing visions and strategies for ensuring the needs of people with disabilities are centered in decision-making. Nico is one of the leaders participating in the Collaborative. Q. What communities do you consider yourself a part of? A. The transgender community and the queer community. The disability justice community. The Black community. The healthcare advocacy community. Q. What leadership roles have you played? A. I’ve had the opportunity to do a lot of speaking at events and rallies, and to give testimony at hearings. I’m on the Board of Directors at Real Choice Initiative and Health Care for All Oregon, and I organize with several other groups focused on justice for vulnerable people. I spend a lot of time advocating for myself and other folks with serious health concerns. Many have shared resources with me, and I enjoy passing that knowledge on to others. I’m mostly focused on housing and healthcare. I strongly believe that housing is healthcare, because no matter how good someone’s healthcare is or how good their nutrition is, if they don’t have housing it doesn’t matter. The waitlist for accessible housing in the City of Portland is fifteen, eighteen years long. Folks are forced into nursing and group homes, where they control almost nothing about their lives. Recently, I heard a friend talking about how hard it is to be twenty years old and living in hospice care. They were trying to study for exams, but instead wound up hanging out with someone who was about to pass because that person’s family didn’t show up. People forced into these situations describe what sounds like imprisonment. They don’t get any privacy. They can’t choose what they want to eat or when to eat. They can’t come and go as they please. They don’t even get to choose when to bath or go to the bathroom. This and ending up on the street is everyone’s worst nightmare, and it's brought to you by your tax dollars. I’m doing my part and encouraging others to join in changing this problem. Q. What leadership roles do you hope to take on in the future? A. I want to organize with other People with Disabilities and serious health concerns, transgender people and people of color to find or create sustainable, accessible and affordable housing and healthcare. I also want to focus on employment for the mentioned populations. Due to capitalism, eugenics and imperialism, I think people with health issues, transgender and non-binary people, and people of color have a harder time getting and keeping jobs. I want to organize folks struggling to find work to become personal care assistants. Then we’ll have someone who doesn’t just tolerate or respect our culture, but who are actual members of the same cultures and communities. Q. What is most exciting to you about disability justice? A. What’s most exciting to me is that it affects everybody. 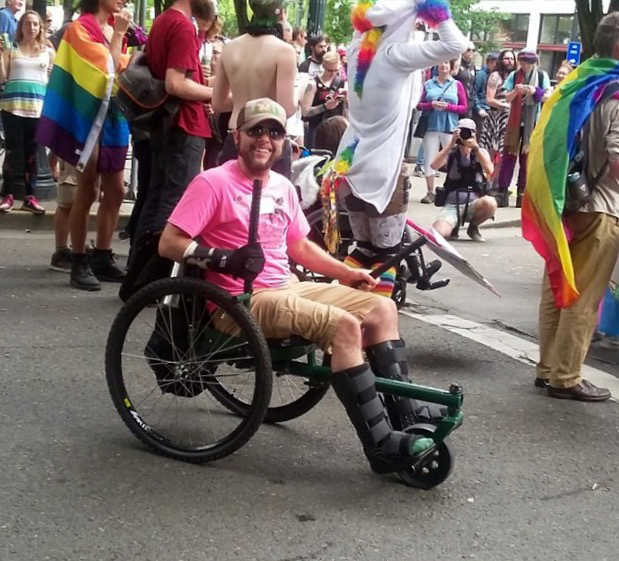 I agree with something a friend and fellow organizer said: “I’m less interested in breaking through the next glass ceiling and more interested in raising the floor.” With disability justice, everybody does better. Q. What do you hope to get out of being a part of the Disability Justice Leaders Collaborative? A. I hope to have a more thorough understanding of where the disability justice movement came from and how I can continue the work. I’ve become disabled in my adult life, so I don’t have as deep of an understanding of it compared to folks that have had altered abilities since birth or childhood. I’m excited about meeting more brown and Black people organizing around Disability Justice. These are all seriously resilient people who know how to survive almost impossible circumstances. These are people who get it and want to change the way things are, not just for us, but for elders and the people coming after us as well. Q. What is your vision for the future of our region? A. The system must undergo revolutionary reformation, because it’s not just a broken system, it’s a system that was built on the broken backs of brown and Black people and that continues to this day. 100 million indigenous people were killed when this land was colonized and 52 million people were killed in the TransAtlantic slave trade. Is it really any wonder why some people’s lives are more difficult than others? Being actively hunted in the streets and/or being thrown into institutions absolutely changes whether or not a person can reach self-actualization. I think We The People must throw capitalism out. In 2017, 82% of the wealth in the USA was in the hands of the top 1%. That means that the other 99% of us are expected to step on the throats of our loved ones and neighbors and fight over the leftover scraps. I, for one, am done with this dynamic, and I think many others are too. I think unlearning the dangerous practice of consuming one thing or another to deal with big feelings is the place to start. Learning how to be in the center of our centers, in the eye of the storm, will help all of us emerge from our "trauma tunnels." From there, everyone learning how to think critically is a part of my vision. I think the Pacific Northwest and the West Coast are places where all this could actually change. I think there are enough people here who care and are actually doing real things to create these changes. The way the Social Security Administration defines disability is all about functionality. If someone has an inability to hold down housing, that makes them functionally disabled, in my opinion. The folks stranded out on the street are on the front lines of a brutal class war, and We The People cannot wait for the State to solve this. We must create ways to meet our needs and the needs of those around us. If there is any place on this land where this could happen, it's Portland, the Pacific Northwest and the West Coast. I envision everyone receiving holistic healthcare and being housed. Unfortunately, institutionalized oppression is real, and this crushes our bodies, minds and spirits. If we get locked out of healthcare and/or housing, it’s almost impossible to develop sustainable connections with those around you, get a job, and so many other things. When someone shows up and is deemed to have red flags – you’re a person of color, you don’t have insurance, you don’t have a place to live, you have depression, chronic pain, you’re trans, queer, you’ve been on opiates, you experience post-traumatic stress, etc. – unless you have a really good support network, advocates, and, in my case, help from my Congressional Representative, you get blown off and end up dead, on the streets or in prison. When I first sought treatment after being hit and dragged around a corner by a station wagon while riding my bicycle, I was blown off, yelled at, humiliated, among many other horrors. For example, it took three years to get a cast on my broken hand. So, it’s really important to me to pass Health Care for ALL Oregon and on the West Coast, while at the same time changing the way people think about healthcare. Many folks are taught to run to the doctor’s office for every piece of advice about how to take care of our bodies, but there’s so much people can do themselves just by changing what we put in our bodies and other daily habits. Q. What is your favorite song, book or movie? Q. Is there anything else you want people to know? A. Please join me in this work at RealChoiceOregon.com and HCAO.org (Health Care for ALL Oregon). Let go of the next glass ceiling, raise the floor and build from the ground up. In 2017 and 2018, Northwest Health Foundation convened the Disability Justice Leaders Collaborative – a group of fourteen disabled people of color interested in deepening their understanding of disability justice and discussing visions and strategies for ensuring the needs of people with disabilities are centered in decision-making. Saara is one of the leaders participating in the Collaborative. A. I’m from a lot of communities. I’m originally from Somalia, which is located in East Africa. I consider myself part of the immigrant/refugee community. I’m also part of the advocacy and social justice communities and the disability community. A. I’m an activist and community organizer. I created a program called Health Care and People with Disabilities within the African Youth and Community Organization (AYCO). This program empowers individuals with disabilities to get education and employment when they are ready. This program gives resources and information to family, adults and parents who have children with disabilities. We have English for Speakers of Other Languages (ESOL) classes, Personal Support Worker training and community education about disabilities. I introduced the AYCO organization to what people with disabilities can do and how they can get resources in this country. Refugees with disabilities are often socially isolated their home. This project is about educating the community to change beliefs and attitudes about disabilities. I’m also part of REAL: Reject Economic Ablest Limits. REAL is about understanding leadership, systems change, and learning and working on employment. We advocated for two positions with the City of Portland. We've also done leadership trainings, and we used the ten principles of disability justice. A. I want to be a part of policymaking. I am interested in participating in advocacy and policy change, because our voice is not there. When we put more people who experience the problem in decision-making positions, we’ll get more solutions to fix the problem. A. I really appreciate this opportunity, because I was fighting for this on my own. Disability justice gives me the opportunity to learn social justice language, build confidence and give me hope to make change. Before disability justice training, I thought no one understood my challenges. I learned that there are activists who are working to change these problems. I appreciate seeing other people working on these issues. I look forward to becoming a better leader and learning more, so I can help more people to become leaders in the future. A. I would like to see the people affected by problems in leadership role: young people with disabilities, immigrants, refugees and people of color. When these people become leaders everyone will benefit. We will all walk together and achieve our goals. A. Actually, I love poetry, because I love the idea behind it. I come from a poetry culture. A. I am a good listener and love to learn. I love meeting new people and learning something different. And I’m open-minded to learn about other people. I would like to travel if I could. Chaunci King founded Royalty Spirits in 2013, distilling and selling Miru Vodka: high-quality pear-flavored vodka made locally in the Pacific Northwest. The name Miru is appropriate, because Miru is a dominating Sea Goddess, and Chaunci plans for her company "to dominate the world of flavored vodkas." She's determined to succeed in a white, male-dominated industry. Micro Enterprise Services of Oregon provided Chaunci with business development services, MarketLink research, an Individual Development Account and financing. Thanks to MESO's support, Chaunci has been able to launch two new products: non-flavored vodka and whiskey. Previously, Chaunci was unable to access capital to grow her business. She lacked strong cash flow, collateral and time spent in business. Chaunci was about to sign up with an online lender whose loans had predatory rates, because she had pending orders and needed to fill them. Fortunately, MESO provided Chaunci with a $30,000 loan just in time. Ron Brown came to Micro Enterprise Services of Oregon in 2007 for help with his first business, Big Body Towing. His excitement was contagious. MESO matched his enthusiasm with their support, setting achievable goals and mapping out strategic plans to help with his vision of growth. Over the years, Ron has gone through numerous challenges, but he has faced them head ­on with a positive attitude. Ron’s customer service is top notch, and his humor gets him through the daily challenges of owning a business. Last year, Les Schwab offered Ron the opportunity to buy the property he was renting. Ron had difficulty raising the needed capital and returned to MESO for advice. As 2015 drew to a close, MESO asked their longtime supporter, United Fund Advisors, if they could place loan capital they'd allocated to MESO to help Ron purchase the commercial property. With United Fund Advisor's consent, MESO provided the $70,000 necessary to purchase the property, currently valued at $225,000. Several individuals and companies came together to help create long­-term financial security for Ron and his family. Because Les Schwab was willing to share their excess property, Ron will have a more sustainable livelihood. Jessica Chan is an industrial designer and the founder of Modern Human Instruments LLC. She has a diverse background, from teaching martial arts and personal training to customer service, construction, freelance art and design. Jessica's parents, immigrants from China, hoped their daughter would become a doctor. However, Jessica's passion lay with entrepreneurship and design. With all her zeal and stubbornness, she began making her mark in the industry. Jessica's first product, an innovative writing instrument called the WinkPen, is built to write with wine, coffee or tea, and it is already sold out. Jessica's vision with WinkPen was to create a sustainable alternative to the everyday writing utensil. She wanted to provide "a high­-end innovative writing instrument for artists and collectors alike." Jessica secured seed funding through Portland Development Commission's Startup PDX Challenge. She also participated in the Streetwise MBA program through PDC and MESO; and she accessed an IDA, MarketLink market research, credit building and financing. Micro Enterprise Services of Oregon is one of Northwest Health Foundation's Kaiser Permanente Community Fund funded partners. Three generations of a family stick their hands in a big pot of soil. They're learning about propagation. Every family should have the opportunity to strive for a healthier, happier and more stable future. When families can support themselves in ways that are meaningful to them, our communities become stronger and we all benefit. That’s why Huerto de la Familia, a community-led organization in Eugene, Oregon, provides the means for Latino families in Lane County to improve their health and economic self-sufficiency. One way Huerto de la Familia does this is through their Cambios Micro-Development Program. Every year, Latino families in Lane County who want to start their own small businesses, or take small businesses they’ve already started to the next level, sign up for weekly classes, participate in one-on-one business counseling sessions and create their business plans. A student works out watering calculations on the whiteboard at farm business class. Over the last year, Cambios Micro-Development Program has expanded and evolved to better meet the needs of community members. Previously, the weekly class ran for ten weeks. Now it runs for twenty. On top of that, participants planning to start farm businesses can sign up for an additional eight weeks of specialized training through a curriculum designed, and taught, by staff from Oregon State University’s Small Farms Program. They practice their new skills for large-scale planting on land donated by Two Rivers and Love Farms. Other participants, who plan to start restaurants, have the chance to test their businesses and earn money in Huerto de la Familia’s food booth incubator. The partnership doesn’t stop there. Huerto de la Familia’s executive director, Marissa Garcia, emphasizes that this work doesn’t result in instant gratification. Huerto de la Famila works with families for years, until they can sustain their businesses on their own. The family behind Tikal Latin Cuisine showcases their Guatemalan food. Huerto de la Familia’s goals for Cambios Micro-Development Program go beyond immediate change. The organization and participants have a bigger vision, for long-term change, as well. They want the Latino families involved to become leaders in Lane County’s business community, and in the community as a whole. Currently, 12% of Oregon’s residents are Latino. That number isn’t reflected in Oregon’s leadership, and Huerto de la Familia hopes Cambios Micro-Development Program will contribute to changing that. Cambios Micro-Development Program's 2016 graduates celebrate their success. Huerto de la Familia is one of Northwest Health Foundation's Kaiser Permanente Community Fund funded partners. Change should always be led by the people who will be most impacted by it. Solutions work better for everyone when they are created by the communities that need them the most. It’s the curb-cut effect. For example, everyone in our region — Oregon and Southwest Washington — has been affected by the affordable housing crisis. Even homeowners feel the impact when neighbors, coworkers and employees, their children’s classmates, teachers, caregivers and countless other community members suffer the stress of housing instability. Housing instability impacts all of us. But who is most impacted? Who should lead the way in confronting this problem? According to Community Alliance of Tenants (CAT), low-income tenants — mainly, people of color, families with children, low-wage workers, people with disabilities and seniors. Which is why CAT is partnering with a number of organizations to advance tenant protections this legislative session. Across our region, increased demand for housing has led to rent hikes and no-cause evictions. Too many families find themselves houseless, priced out of their cities and towns, sleeping on friends’ couches, in cars and shelters, even on the street. Without a safe place to call home, they struggle to keep their jobs, feed their kids and get them to school. Families who haven’t been evicted are too scared to ask their landlords for necessary repairs and improvements; they’re afraid of retaliation. Meanwhile, their children suffer from “slum housing disease” due to unhealthy living conditions. Their fear is warranted. Families with small children, especially from immigrant and refugee communities face higher barriers to quality housing, and they’re more vulnerable to discrimination, retaliation and involuntary displacement. CAT members, as well as their majority-tenant board of directors, identified no-cause evictions and lifting the ban on rent-stabilization as their top priorities. So CAT responded by convening the Stable Homes for Oregon Families Coalition, a group of over 75 organizations advocating for the 40% of Oregonians who rent their homes. CAT also initiated the Tenant Leadership Council, composed of parents of color to lead the #JustCauseBecause campaign this legislative session. The Tenant Leadership Council spent time helping shape House Bill 2004, vetting it against their experiences, and mobilizing their fellow tenants to participate in various actions, including phone banking, visiting their legislators, hosting rallies and supporting civic engagement opportunities for renters. They also coordinated lobby days at the Oregon State Capitol and developed and presented testimony in support of the bill. On February 4, they packed a listening session with 250 people, and 20 legislators and their staff attended to hear residents from all over Oregon share their stories. On April 30, they plan to pack another listening session in Eugene. Thanks to the leadership of low-income Oregon tenants, we trust #JustCauseBecause and #RentStabilization are the best choices for our state. We may not end the affordable housing crisis with these two bills, but we will reduce stress and fear, mitigate displacement and ensure renters feel supported enough to demand healthy living conditions. And everyone in our region will benefit because of it. Community Alliance of Tenants is one of Northwest Health Foundation's Kaiser Permanente Community Fund funded partners. It's giving season again, folks! That means Willamette Week's Give!Guide is collecting donations now through midnight on December 31st, with a goal of raising $3,600,000 total for 141 deserving Portland nonprofits. Several of those 141 nonprofits are Northwest Health Foundation's past and current funded partners. We've highlighted five below! These community organizations are doing amazing work for our region, and they have earned every bit of support you can offer them. What is Black Parent Initiative? Black Parent Initiative (BPI) is the only culturally specific organization in Portland focused solely on supporting parents as a vehicle for enhancing the lives of Black youth. It helps families achieve financial, educational and spiritual success. How is NWHF supporting BPI? NWHF is currently funding BPI through the Kaiser Permanente Community Fund to engage low-income African American families in comprehensive home-visiting services. Why should I give to them? Children are more likely to succeed in learning, life and realizing their dreams when supported by stable and engaged adults; and communities are more likely to succeed when they prepare their children to succeed. By supporting BPI, you support a vibrant, thriving Portland. What is Community Alliance of Tenants? Community Alliance of Tenants (CAT) builds tenant power through education, advocacy, building-based organizing, leadership development and membership engagement. How is NWHF supporting CAT? Last year NWHF supported CAT's Renter State of Emergency campaign. Why should I give to them? Portland is in the midst of an affordable housing crisis, and renters are the people most impacted by it. CAT is on the front lines striving to protect renters through advocacy and legislation. In 2015, CAT's Renter State of Emergency prompted the City of Portland to declare a Housing State of Emergency. Now CAT is running a #JustCauseBecause campaign to protect tenants from no cause evictions. By giving to CAT, you contribute to all Oregonians having a stable place to live. What is Immigrant and Refugee Community Organization? Immigrant and Refugee Community Organization (IRCO) promotes the integration of refugees, immigrants and the community at large into a self-sufficient, healthy and inclusive multi-ethnic society. Founded in 1976 by refugees for refugees, IRCO has nearly 40 years of history and experience working with Portland's refugee and immigrant communities. How is NWHF supporting IRCO? IRCO is the lead organization for one of our Healthy Beginnings+Healthy Communities Collaboratives: Immigrant and Refugee Engage Project. Why should I give to them? Immigrants and refugees are a boon to our communities and our economy. Unfortunately, many of them now face the likelihood of unjust legislation by the new federal administration that will try to force many of them to leave their homes and lives in the U.S. By donating to IRCO, you support immigrants and refugees to adjust to American society, find jobs and advocate for themselves. What is Partnership for Safety and Justice? Partnership for Safety and Justice (PSJ) works with people convicted of crime, survivors of crime, and the families of both to advocate for policies that make Oregon’s approach to public safety more effective and more just. Why should I give to them? Incarceration has a huge negative impact on a person's future, as well as on their family's. For example, children of prisoners are more likely to drop out of high school, abuse drugs and alcohol, become teenage parents, commit crimes, and become unemployed and/or homeless. By donating to PSJ, you help families overcome the obstacles of life after incarceration and prevent more kids from losing their parents to prison in the future. What is Urban League of Portland? Urban League of Portland (ULPDX) is one of the oldest African American service, civil rights and advocacy organizations in the Portland metro area. ULPDX’s mission is to empower African Americans and others to achieve equality in education, employment, health, economic security and quality of life. How is NWHF supporting ULPDX? NWHF last funded ULPDX to convene community members to discuss priorities related to improving children's health and education. Why should I support them? Oregon has a deeply embedded history of discrimination against African Americans. By giving to ULPDX, you contribute to dismantling racist systems and support programs that uplift the African American community. On June 7th at Revolution Hall, Outside the Frame will premiere The Lost Boys of Portlandia, a documentary featuring the real lost children of Portland – homeless youth. Outside the Frame, originally a program of Outside In, is a nonprofit that offers homeless youth paid internships and film workshops that provide hands on technological training and relevant job experience. The youth involved produce original films depicting issues pertaining to and determined by homeless youth. A number of these short, youth-made films will also screen at the premiere of The Lost Boys. Claim your ticket here. Outside the Frame aims to change the way homeless and marginalized youth see and are seen by film. By making films, youth are able to speak and advocate for themselves and issues they care about, as well contribute to changing the systemic barriers homeless youth face. The Lost Boys of Portlandia premiere is sponsored in part by Northwest Health Foundation. It's giving season again, folks! That means Willamette Week's Give!Guide is collecting donations now through midnight on December 31st, with a goal of raising $3,250,000 total for 143 deserving Portland nonprofits. Several of those 143 nonprofits are Northwest Health Foundation's past and current funded partners. Check them out! We've included five below, and you can find more in our Grants Archive. These community organizations are doing amazing work for our region, and they have earned every bit of support you can offer them. Adelante Mujeres provides holistic education and empowerment opportunities to low income Latina women and their families to ensure full participation and active leadership in the community. Their programs include child and adult education, youth leadership, business development, a farmers market and more! Most recently, NWHF awarded Adelante Mujeres a Kaiser Permanente Community Fund (KPCF) grant for ESPERE, a program aimed at addressing the issue of individual, familial and societal violence among Latino immigrant families. Hacienda CDC is a Latino Community Development Corporation that strengthens families by providing affordable housing, homeownership support, economic advancement and educational opportunities. This year, Hacienda CDC opened the Portland Mercado, Portland's first Latino public market. A KPCF grant helped fund the establishment of this economic and cultural hub in SE Portland. Latino Network provides transformative opportunities, services and advocacy for the education, leadership and civic engagement of our youth, families and communities. NWHF supports Latino Network through a KPCF grant to Juntos Aprendemos, a program that prepares 3-5 year olds for success in kindergarten and equips parents with the skills and confidence to be their child’s first teachers. REACH provides quality, affordable housing for individuals, families and communities to thrive. Recently, REACH completed an affordable housing project called Orchards at Orenco, which won recognition for being the largest multi-family Passive House building in the United States. KPCF funded REACH to investigate strategies and best practices to develop and implement a paid job training program for REACH residents. Village Gardens brings a spirit of hope to the people by growing and sharing healthy food, learning and teaching skills, and empowering community leadership. Village Gardens includes individual and family garden plots, employment opportunities for adults and teens, after-school and summer activities for children, homework clubs, an emerging livestock project, a Community Health Worker program, and a youth-run entrepreneurial business. KPCF is funding Village Gardens to launch a community driven network of food based micro enterprises. When calculating the costs of war, we often neglect the health and economic costs of traumatized immigrants coming to the U.S. as refugees from violent, and prolonged, conflicts in places such as Vietnam, Afghanistan and Iraq. Despite being tens of thousands of miles from the war zone, Oregon’s Iraqi population is still struggling with the resonating consequences of violence and displacement. Many who sought refuge and asylum in the United States from the first Iraq war continue to deal with lingering trauma - more than twenty years after immigration. Research shows that refugees from wars and civil conflicts are particularly vulnerable to ill health. The Iraqi Society of Oregon (ISO) is dedicated to helping immigrants deal with the trauma they experienced in their home country, the culture shock of adapting to new lifestyles and systems, and economic and social isolation they still experience today. These challenges have been identified as “triple factors” of trauma that make so many immigrants vulnerable to ill health. In December 2011, the Iraqi Society of Oregon received a $50,000 capacity-building grant from the Kaiser Permanente Community Fund to gain social, psychological, and medical support for Iraqi immigrants. “This project will work on researching, educating, and healing the immigrants and refugees so they gain life skills for a positive health attitude and create a change to seek a healthy lifestyle,” said Baher Butti, executive director. Baher Butti was a practicing psychiatrist in Iraq until he fled from the most recent war in 2006. He was exiled in Jordan when Dr. David Kinzie, a professor of psychiatry at OHSU, invited him to a world conference to speak about the psychological trauma. Dr. Kinzie ultimately helped him find asylum in the U.S. Through the Kaiser Permanente Community Fund, the Iraqi Society, the Center for Intercultural Organization, and the Beaverton Mayor’s Office are now working collaboratively to respond to the Iraqi population’s needs by coordinating culturally-specific services, mental health, city government, and schools. This solution moves Iraqi immigrant “upstream” by bringing together social and economic integration with a holistic mental health approach. While the wider community will now have the opportunity to connect with the Iraqi community, Butti says the newcomers have a responsibility too. MIRIAM AND JOSE WENT TO INNOVATIVE CHANGES TO BUILD THEIR CREDIT. The answer makes sense once you know more about the nonprofit financial institution, Innovative Changes, and the grant maker, which in this case is the Kaiser Permanente Community Fund. Kaiser Permanente Community Fund (KPCF) is a partnership between Kaiser Permanente Northwest and Northwest Health Foundation. The fund invests grantmaking dollars in the places “where health begins” —projects and organizations whose work addresses the social determinants of health. As the staff at Innovative Changes can tell you, financial issues can very often be connected directly to health. Research shows a strong correlation between high income and good health. Likewise, financial struggles often lead to a downward spiral culminating in emergency rooms, shelters, hospitals, or even the streets. People in financial crisis often turn to payday loans, which almost always exacerbate the situation. A $300 car repair can mean that a single mom with a stable job cannot get her children to daycare or herself to work. This can result in lost wages, and an increase in family stress. If monthly bills aren’t paid, a payday loan can push her into an unsustainable cycle of debt. Her credit and rental history are damaged, and her struggles only get worse. “We know that financial stress can have serious health effects on an individual and also on family members,” says Victor Merced, a member of the Kaiser Permanente Community Fund advisory board. Innovative Changes offers an alternative to predatory payday loans by providing comprehensive financial education, small dollar, short-term consumer loans, and credit building opportunities to help people manage short-term financial needs in order to achieve and maintain financial and household stability. Miriam and José (pictured) came to the U.S. 32 years ago as they fled the civil war in their native El Salvador, and are two appreciative clients of Innovative Changes. Their story demonstrates the strong network of community partnerships developed by the nonprofit. In this case, Innovative Changes worked with two of their partners, Proud Ground, and the Native American Youth and Family Center (NAYA). “We’re glad we came here and got help,” José said. Jose works as a pastor associate and deacon at a Catholic church and works extensively with the church’s Hispanic community. “Innovative Changes helped us build our credit,” José said.